Gas Safe engineers hold separate qualifications for different types of gas work. It is not enough that they are gas safe registered, they must be registered to work on your type of gas appliance. So before you pick someone, you need to check they are competent for the type of gas work you would like carried out. For example, an engineer might be qualified to work on your boiler but not your cooker. We breakdown the gas safe qualification and guide you on who can do what. We also give some helpful advice on when you do not need a gas safe registered engineer to work on your heating system. boilers, water heaters, cookers, gas fires, warm air, pipework, combustion analysis and range cookers. with their company or individual gas number – found on their card. Or via their company name, on the Gas Safe register website. a good plumber can work on radiators, pipework and external controls on your heating system. Do you need someone to work on your boiler, your gas fire or your cooker? The gas safe qualification separates these types of gas appliance so that someone qualified in gas boilers would need to have undertaken additional training to work on a gas fire or gas cooker. The table below sets out the main types of gas appliance covered under the domestic gas safe qualification. 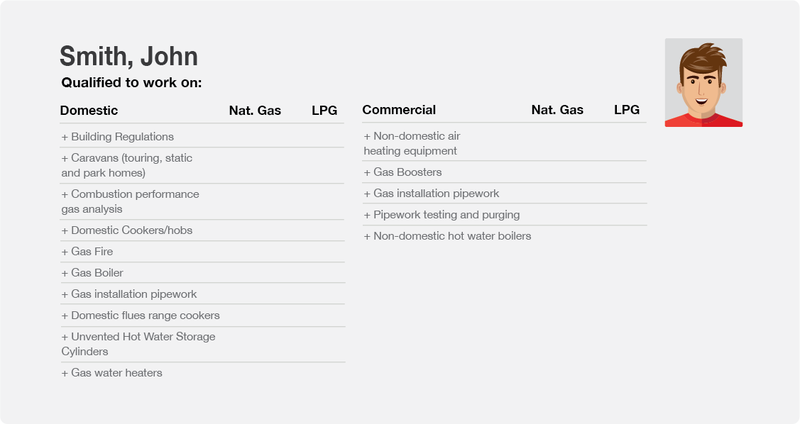 The left hand columns shows the appliance, and what is included or excluded as applicable, and the right hand column sets out the range of activities the gas engineer can undertake in relation to that appliance, which is usually everything. Gas Installation pipework (upto 35mm) Core gas safety knowledge held by all gas safe registered engineers. It is unlikely this qualification is held in isolation as there is almost nothing the engineer can work on aside from the gas pipe and even then they cannot connect onto a boiler or commission it. Gas boiler (includes back boilers, combi boilers, heating only and system boilers, storage heaters and instantaneous water heaters) Qualified to work on all aspects of your domestic gas boiler - installation, dis-connection, commission, service, repair and safety checking. Gas water heaters This qualification is included with an engineer's Gas Boiler competency (above). However if held in isolation, the engineer is only qualified to work on your domestic, instantaneous gas water heater. A water heater will only provide hot water. It is a wall hung unit and looks like a boiler - not to be confused with a hot water cylinder. Cookers and hobs (excludes range cookers) Qualified to work on all aspects of your gas cooker - installation, dis-connection, commission, service, repair and safety checking. Fire/space heater (includes gas fires, wall heaters, convector heaters, gas stoves and flueless gas fires) Qualified to work on all aspects of your domestic gas fire - installation, dis-connection, commission, service, repair and safety checking. Warm Air (blown heating systems) Qualified to work on all aspects of your gas fired ducted warm air heaters - installation, dis-connection, commission, service, repair and safety checking. Range cookers (including range gas cooker/boilers) Qualified to work on all aspects of your gas fired range cooker and range cooker boiler - installation, dis-connection, commission, service, repair and safety checking. Comb Analysis (Combustion Analysis) This qualification is now a mandatory part of an engineer's core qualifcation. It is required to test the combustion peformance on any gas fired appliance when commissioning following an installation, re-commissioning, after servicing or replacing parts. LPG (bottled gas) appliances. An engineer will need to be qualified in LPG for each gas appliance listed to work on an LPG supplied appliance. Unvented hot water cylinders –not technically a gas safe qualification but listed on their ID cards. This qualification can be held without being gas safe registered in fact, but it is mandatory in order work on an unvented hot water cylinder. Vented hot water storage – this is all standard cylinders and the vast majority of gas safe engineers will have this as part of their basic qualification. Again this qualification can be held without being gas safe registered. Caravans – a very specialist area that requires a separate qualification as well as holding the LPG (bottled gas) qualification. Vented hot water storage Standard cylinders and most engineers are now qualified as part of their core training. Caravans (including static homes, touring and park homes) Bottled gas appliance that still require an engineer to be seperately listed in this category of accomodation. Firstly, their photo ID card. Make sure it is them and is their membership is in date. Each engineer is given an individual licence number shown at the top of the card. If they work for a company there will also be a company number listed on their card (see below). The front of the card will detail the expiry date of their registration. Secondly, check they are qualified for the work they are coming to do. The back of the card lists the appliances they are qualified to work on. The list will also show when the qualification(s) expires. It is quite common for qualifications to expire at different times, as engineers add to their qualifications over the course of their careers. You can search the gas safe register by postcode to find a local installer. NB The default is set to look for a ‘mains gas’ company, but you can filter to LPG to narrow your search. Enter their ID number or company name. NB if do not have the company ID number, sometimes it’s hard to find them by name. Companies frequently change their trading name or list their limited company name which is different to their trading name. You may need to go back to the postcode search to find them that way. If you have their licence number, found on their ID card, you can enter it in this section. If you do not have their licence number, but they work for a company, you will be able to find them under the company listing, either by the company registration number, company name or via their postcode. If they do not work for a company, they can be hard to find without the licence number. You will likely have to ring the Gas Safe Register customer services line. Advice by job type – do you definitely need a gas safe engineer? Not all heating jobs need a gas safe registered engineer. Many can be undertaken by a qualified plumber. NB hot water qualifications are held by gas engineers and plumbers. The table below sets out common heating and plumbing jobs and when you need a gas safe registered engineer to attend. For more information on finding the right person for the job, view our Plumber or Heating Engineer Guide. Repair or Replace your boiler?